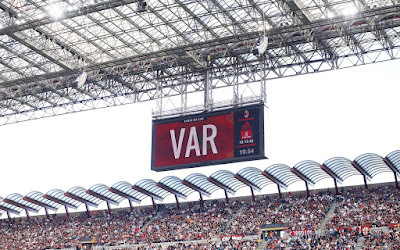 Besides the fact that I have completely lost my appetite for lasagna after this match, I couldn’t help but notice a bit of VAR Karma, or VARma™. Udinese’s president, Pozzo, had spoken out in favor of VAR this week, as he felt it would end his perceived referee favors to Juventus. Little did he know that VAR is all powerful and all-knowing, and it could also impact his team negatively, too. So while Milan were being force-fed some Lasagna, Udinese received some VARma™. The match started off well enough until the tenth minute, when Lasagna scored, only to have his goal disallowed after a VAR review for offside. I was dying to see if Pozzo was there and what his face looked like. Wonder if he ever thought about how VAR could also negate any ref favors for Udines? 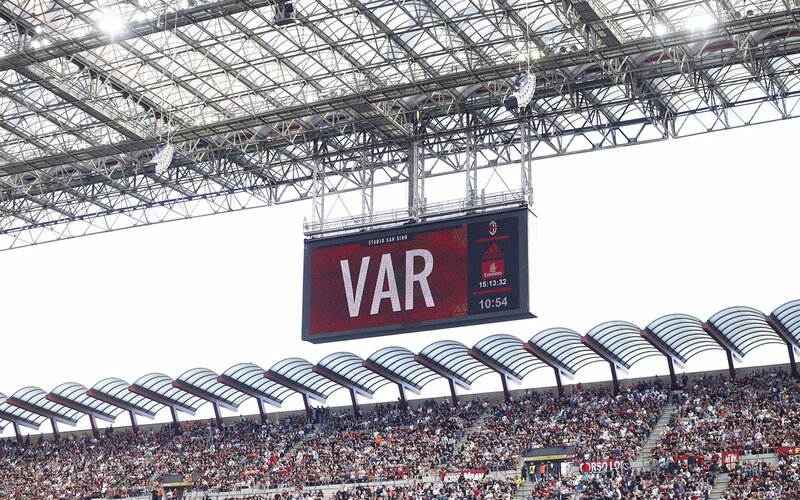 However in replays, this looked to be the correct call in this situation, even if it was VARma™ for Udinese. Technology was on display again in the 19th minute when it took GLT (Goal Line Technology) to be certain that Bonucci’s shot didn’t fully cross the line after Kalinic had hit the bar. But then in the 22nd, there could be no mistaking, Kalinic scored on an assist from Calabria to open up his scoresheet and make it 1-0 Milan. Five minutes later, Romagnoli got a yellow for being a bruiser, and stopped just short of earning a second yellow by complaining to the ref about it. I assume his move just two minutes later was penance for his behavior, as it was in the 18th that he passed it to Lasagna, who took it and slotted it past the other two Milan defenders to make it 1-1 all. I’m going to guess Romagnoli won’t want any Lasagna for a while, either. Not to fear, however, as three minutes later, Kalinic scored his second goal to make it 2-1 Milan. There were some great performances, such as Kessie, who almost singlehandedly powered the midfield, made dribbles, and even took shots. Then Montella made subs, Cutrone on for Suso and Calhanoglu for Bonaventura in the 69th minute, then finally subbing Kalinic off for Locatelli in the 85th. But not before Kalinic scored a third goal, which was called back for offside after VAR was used. This one confused me, as all of the screenshots and replays showed him onside. But maybe one of his shoelaces was offside, who knows? Their screens must be very high res or something. Although it denied Kalinic his hat trick, it didn’t change the score or impact the match like Lasagna’s first goal would have. I felt like there was improvement in play, and it gave me slightly more confidence in Montella’s preoccupation with his 3-5-2. I still don’t understand why Silva and Calhanoglu didn’t get the start. Sure, they had just played Thursday, but they both have fewer minutes overall than many of the starters. 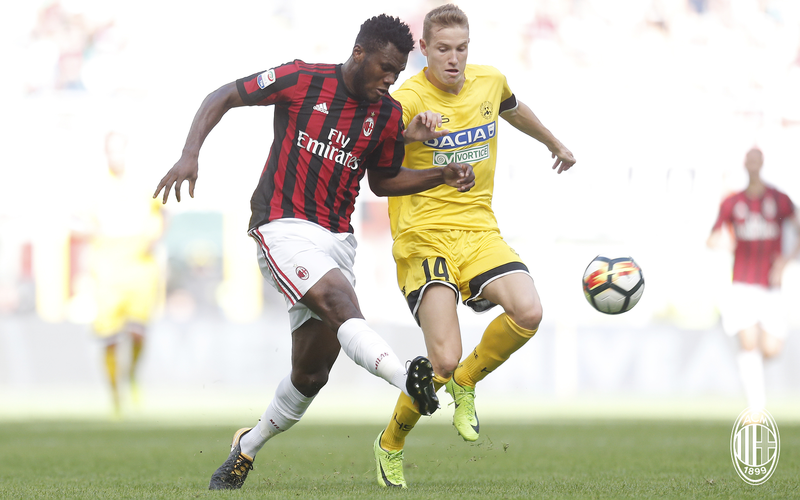 Kessie, for example, will need to be rested at some point. We saw again that VAR has no friends, but is quickly making enemies. But also if you criticize the refs, it will come back to haunt you. So while Milan enjoy the three points and move on to Wednesday’s match, Pozzo and Udinese enjoy some VARma™.